The power post system delivers a versatile pulling system for repairing trucks, buses and containers. With a maximum pulling height of 4.20 metres the pulling towers offer an all-round repair of the largest vehicles. Combined push/pull facility with 15T rams give a pulling system capable of delivering 30T of power. The system is anchored by floor pots meaning when it’s not in use, it’s not in the way. The tower has mounted wheels meaning set up and storage is quick and strain free. You can adapt extensions onto tower to suit vehicle height. Can repair chassis and high structures. Permanent pulling due to chains keeping their tension even when the ram reaches its maximum stroke and retracts. 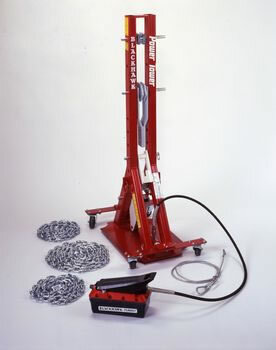 Due to the spring-mounted wheels, you are able to move the tower quickly and without any problem in your workshop from one point to the other without dismounting the extensions or the chains. After pulling the working area stays free. You can use several pulling towers at the same time. You can also use pushing rams to repair the most severe damage.